Easy access, better visibility in new RoGator models. When farmers talk about a wish list for their sprayer, easy access to service points and high visibility from the cab are often mentioned. The RoGator line, RG900, RG1100 and RG1300 for 2012, introduced at Agco's recent product launch, offer an improved hood design, mirrors, lighting, backup alarm and cab noise reduction to grant some of those wishes. All RoGator models have a proven drivetrain system, AgcoPower 8.4 liter diesel engine with e3 SCR technology for a boost in horsepower. A new longitudinal A suspension makes headland turning easier and transfers less motion to the cab. 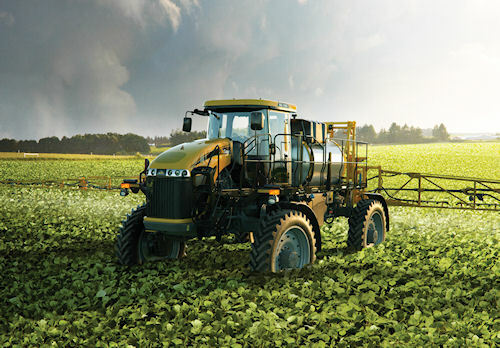 The new RoGator series of sprayers for 2012 offer ground-level access for most service points, along with enhanced operator visibility. The 2012 machines also come with stainless steel boom-plumbing endcaps for better accuracy, clean-out and on/off times, more convenient layout of operator armrest controls and an enhanced operator environment.